The CGC SHEETROCK 16-Litre All Purpose Conventional Weight Ready-Mixed Drywall Compound is an excellent compound for joint finishing (taping, filling and finishing). It's ready-mixed formulation is creamy and smooth, giving it excellent slip, bond strength and easy workability. It can be used directly from the container and requires minimal mixing and/or thinning. 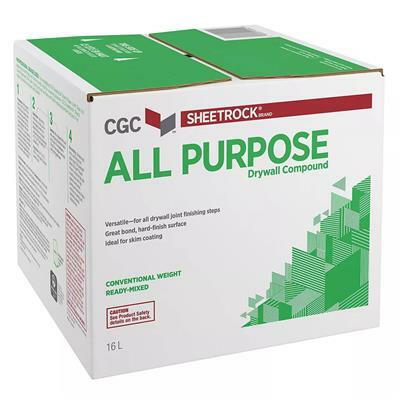 CGC Sheetrock® Brand All Purpose Drywall Compound can also be used for fasteners, bead, trim and skim coating.